Member of the Centre for Micro- and Nanomechanics at School of Engineering of the University of Aberdeen, Scotland. Academic degrees: Dipl.-Eng. (Diploma with Distinction, Lviv State University), 1963; Candidate of (Physical-Mathematical) Sciences (PhD), 1968, conferred by Taras Shevchenko Kyiv University; Doctor of (Physical-Mathematical) Sciences (DSc), 1982, conferred by Mikhail Lomonosov Moscow University; Professor, 1987, Physical-Mathematical Faculty, National Technical University of Ukraine "Kyiv Polytechnic Institute". Author of 410 publications, including 7 monographs on waves and composite materials and 6 university text-books on waves in materials, viscoelasticity, wavelet analysis, fractal analysis; about 210 journal papers, 6 State Standards and so on. Publications: in journals of the most prestigious academies of sciences - Comptes Rendus de l'Academie des Sciences, Serie IIb Mecanique; Philosophical Transactions of the Royal Society A: Мathematical, Physical and Engineering Sciences; Atti dell'Accademia Peloritana dei Pericolanti, Classe di Scienze Fisiche, Matematiche e Naturali – French, English, and Italian, respectively; in leading world journals - Applied Mechanics Reviews, Composites. Part A: Applied Science and Manufacturing, Composites Sciences and Technology, International Journal of Solids and Structures, Zeitschrift für Angewandte Mathematik und Mechanik - ZAMM, International Applied Mechanics, Computer Modeling in Engineering and Sciences, International Journal of Nonlinear Sci-ences and Physical Simulation, Mechanics of Composite Materials, Mathematical and Computer Modelling in Dynamical Systems, International Journal of Applied Mathematics and Mechanics and others. Last books: 1. Cattani C., Rushchitsky J.J. Wavelet and wave analysis as applied to materials with micro- or nanostructure. Singapore-London: World Scientific Publishing Co. Pte. Ltd., 2007. – 466 p. 2. Guz A.N., Rush-chitsky J.J., Guz I.A. Introduction to mechanics of nanocomposites, Kiev: Akademperiodika, 2010. – 398 p. (In Russian). 3. Guz I.A., Rushchitsky J.J., Guz A.N. Mechanical Models in Nanomaterials. In: Handbook of Nano-physics. In 7 vols. Ed. K.D. Sattler. Vol. 1. Principles and Methods. Boca Raton: Taylor & Francis Publisher (CRC Press), 2011. – 827 pp. Last key journal publications: 1. Revisiting displacement functions in three-dimensional elasticity of inhomoge-neous media. Int. J. of Solids and Structures, 2009, co-author Kashtalyan M. 2. Fragments of the theory of nano-transistors: self-switching of the plane transverse hypersound wave in composite materials, Int.Appl.Mech., 2009. 3. 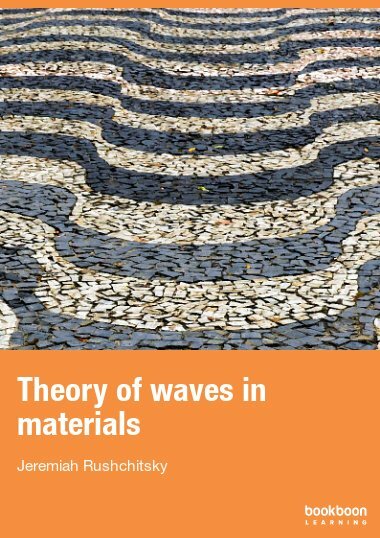 On progress in the theory of nonlinear waves in materials, based on Murnaghan and Signorini potentials (review), Int.Appl.Mech., 2009. 4. On constructing the foundations of mechanics of nanocomposites. Int.Appl. Mech., 2011, co-author Guz A.N. 5. Modeling nanocomposites of complex shape. Int.Appl.Mech., 2011, co-au-thor Guz A.N. Presentations and lectures delivered at more than 150 international congresses, conferences, symposia and semi-nars (Australia, Austria, Azerbaijan, Armenia, Belarus, Bulgaria, Canada, Chile, China, Czech Republic, Den-mark, Estonia, France, Georgia, Germany, Great Britain, Greece, Hungary, Italy, Israel, Kyrgyzstan, Latvia, Poland, Russia, Serbia, Slovakia, Spain, Sweden, Switzerland, Ukraine, USA, Uzbekistan), membership in scientific and program committees of many international symposia. Two bases – Thomson Reuters ISI and Google Scholar – differ names Rushchitsky and Rushchitskii and propose (thinking Rushchitsky and Rushchitskii as two different persons) two different lists of publications. Scopus gives the united list for both names, but for the option Rushchitsk* only. Besides that, ISI and Scopus propose two dif-ferent lists: for the having of electronic copies publications and for the publications included into the data base without the electronic copies (books, some articles, abstracts and so on).